Alexander Macomb was born on 3 April 1782 in Detroit, MI, the son of Alexander and Mary Catherine Navarre Macomb. He moved with his parents to New York City and received a "classical education" at Newark Academy in New Jersey. Macomb, at the age of 16, joined a New York militia company. In January 1799, with the recommendation of Alexander Hamilton during the French emergency, he was commissioned a Cornet in the Regular Army. In March he was promoted to Second Lieutenant, and honorably discharged in June 1800. In February 1801, he was commissioned a Second Lieutenant, Second Infantry, serving as Secretary to a commission that treated with the Indians of the Southeast. 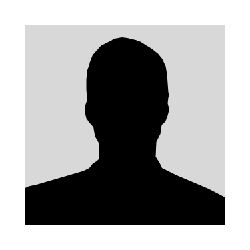 He was commissioned a First Lieutenant in the Army Corps of Engineers, which was established in 1802 at West Point, NY, to constitute a Military Academy, thereby becoming one of the first officers to receive formal training there. Macomb then spent five years in charge of coastal fortifications in the Carolinas and Georgia. He also established fortifications at Fort Gratiot, MI; Chicago; Mackinaw; Prairie du Chien; St. Peter's; and St. Mary's. Macomb won acclaim during the War of 1812 as a Brigadier General in command of the frontier of northern New York. At the Battle of Plattsburgh on 11 September 1814, with only 1,500 regular troops and some detachments of militia, he was opposed by a British force of 10,531 men under Lieutenant General Sir George Prevost. Macomb's heavily outnumbered troops fell back before the British columns in a series of encounters as Prevost advanced towards the American defensive works. In the weeks leading up to the battle, Macomb, knowing full well he would be outnumbered heavily, worked with his men to move trees and create fake roads in order to obscure the genuine roads and lead the British into dead-end traps far from the three nearby American forts (a maneuver Macomb called abattis). The British attack was diffused. Long narrow lines of marching soldiers were unable to easily stop and about-face. They became entangled in the narrow false road maze, and were sitting targets for the waiting Americans. The British were about to launch an assault on the American defenses when the news came through of the defeat of the British Naval Squadron on Lake Champlain. Prevost needed the British Lake Champlain Squadron to supply his planned advance into Vermont. Without it, he had no choice but to abandon the Expedition. The British invaders marched back to Canada. Although Commodore Thomas MacDonough's sailors, and not the Army, had been largely responsible for stopping the British invasion, Macomb was nevertheless showered with praise and styled "The Hero of Plattsburgh" by some of the American press. He was promoted to Major General for his conduct at this battle, and received both the thanks of Congress and a Congressional Gold Medal. When Major General Jacob Brown, the U.S. Army's Commanding General, died in February 1828, Macomb was the senior Brigadier General on the Army List and President John Quincy Adams promoted him substantive Major General as was Macomb's right. The Army's 2nd and 3rd ranking Brigadier Generals bitterly contested this; Winfield Scott and Edmund P. Gaines - denounced each other publicly and for months had been contesting for the position. Their quarrels scandalized the Army and drove Adams to nominate Alexander Macomb, the Chief of Engineers, who by then had reverted rank to Colonel, as the Army's top general. His last active service in a theater of battle was in the Seminole War in 1835. Macomb's tenure as Commanding General was marked by "continuing uncertainty about the responsibilities and authority of his position." 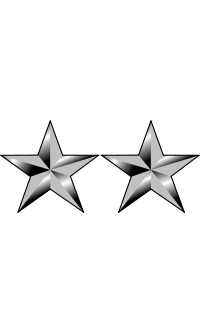 To secure his seniority over the other two-star brevet major generals, Macomb added a provision in the 1834 Regulations that "the insignia of the major general commanding in chief should be three stars." In the same document, he sought to define his relationship to the Secretary of War and establish his primacy over the bureau chiefs, including his successor as Chief of Engineers. This was easier said than done. Most issues were not fully resolved until early the next century. He advocated doubling Army strength, increasing enlisted pay, providing relief for some widows and orphans, and standardizing the officer retirement and replacement system. In 1840 the Army Corps of Engineers adopted the castle uniform insignia and first described the Corps of Engineers' distinctive Essayons (Motto: "Let us try") button. In 1809 and 1841, he was the author of a seminal book (republished in the 21st century) on conduct of courts martial and martial law. He also wrote a play on Pontiac's siege of Detroit which features his grandfather, Robert Navarre. Macomb was the first of five Commanding Generals (Chiefs of Staff after the 1903 reorganization) who held Engineer commissions early in their careers. All transferred to other branches before rising to the top. The others were George B. McClellan, Henry W. Halleck, Douglas MacArthur, and Maxwell D. Taylor. A curious feature of Macomb's career is that, like Dwight Eisenhower, he became a military hero without ever actually coming under enemy fire in his life. Major General Winfield Scott was named Macomb's successor after working "hard at mending fences in the intervening 13 years . . ."
Alexander Macomb is recognized in a Michigan Historical Marker that is situated at the corner of Gratiot Avenue and Macomb Street in Mount Clemens, MI. It is Registered Site S0418, erected in 1974. It states: "Alexander Macomb. In 1818 Territorial Governor Lewis Cass proclaimed the third Michigan county to be called Macomb. At that time the young General was Commander of the Fifth Military Department in Detroit. Born in that city in 1782, son of prominent local entrepreneurs, Macomb had entered the U.S. Army in 1799. He had gained national renown and honor during the War of 1812 for his victory at Plattsburgh in September 1814 over a far superior force of British invaders. 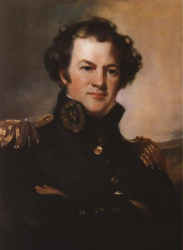 Later as Chief Army Engineer he promoted the building of military roads in the Great Lakes area. From May 1828 to his death in June 1841, Macomb served as Commander-in-Chief of the Army. He is buried in the Congressional Cemetery in Washington D.C. His birthday, April 3, is honored as Macomb County Heritage Day." Several statues were erected in his honor. One was sculpted by Adolph Alexander Weinman and erected in 1906 in downtown Detroit, MI. This statue was made from melted down cannons, and was a notable and monumental task. Another is in downtown Mount Clemens, MI, in front of the Circuit Court building at 40 N. Gratiot Avenue. Although an amateur, Macomb is recognized as an artist. His painting Detroit as Seen from the Canadian Shore in 1821 is a watercolor and pencil in the collection of the Detroit Institute of Arts. During the 1820s, Macomb was a member of the prestigious society, Columbian Institute for the Promotion of Arts and Sciences, who counted among their members former presidents Andrew Jackson and John Quincy Adams and many prominent men of the day, including well-known representatives of the military, government service, medical and other professions. The Alexander Macomb Chapter of the Daughters of the American Revolution is situated in Mount Clemens, Michigan, and was founded in June, 1899. Macomb Hall, a dormitory on the Plattsburgh State college campus, several miles from the shore of Lake Champlain. In World War II, the United States Liberty ship SS Alexander Macomb was named in his honor. His son was Commodore William H. Macomb. Major General Alexander Macomb died on 25 June 1841 while in office at Washington, DC. He is buried at the Congressional Cemetery in Washington, DC. His remains, and those of his wife, Catherine, were disinterred in June 2008 so that the brick-lined burial vault beneath their 6 ton, 13-foot-tall marble monument could be repaired to prevent its impending collapse. During the month it took to make the necessary repairs, the couple's remains were kept at the Smithsonian and were viewed by several of the General's descendants including his great-great-great granddaughter. After the $24,000 repairs were completed by the Department of Veterans Affairs, their remains were re-interred on 17 July 2008. It is said that the monument to Alexander Macomb is "one of the most unusual in the nation."